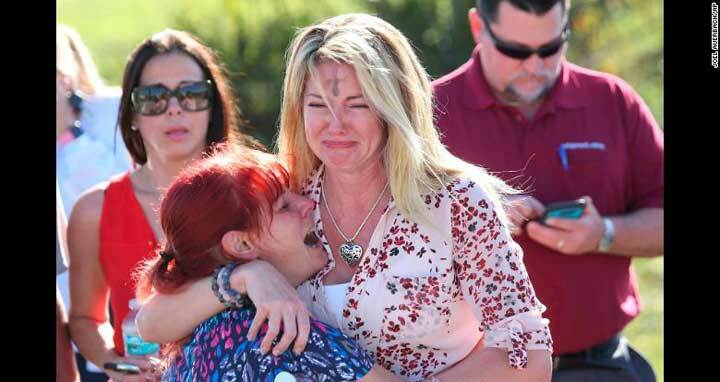 Parents wait for news after a shooting at Marjory Stoneman Douglas High School in Parkland, Florida, on Wednesday, February 14. At least 17 people were killed at the school, Broward County Sheriff Scott Israel said. The suspect, 19-year-old former student Nikolas Cruz, is in custody, the sheriff said. The sheriff said he was expelled for unspecified disciplinary reasons. Jay Parini: Guns are a religion now. And too many of our fellow citizens -- including evangelical Christians, of all people -- will continue to heedlessly worship at this altar, despite the dead children, the dead teachers, the dead concertgoers and the innocent bystanders who must sacrifice their lives for others' overriding faith in their weapons. They will, unless you do something. They are in something like a cult, and like all cults, difficult to break from, to stop or influence. It's an American thing, religious — yes -- in scope, fundamentalist in its fanaticism and fervor, without precise parallel anywhere else in the world. As a Christian, I'm appalled by the hypocrisy I see among others of my faith, particularly those who are our leaders in government and show eagerness to participate in this cult. They worship false idols in the form of weapons, and turn their back on the teachings of Jesus, who did not equivocate when it came to violence. It is safe to say that nobody in the cult of guns listens to Jesus. We're reminded of the evil at the heart of this every month or so, when some demented individual gathers a cache of semiautomatic firearms — or even, as in the case of the Parkland, Florida, school shooting Wednesday, just one powerful assault rifle -- and goes on a rampage. Parkland will before long drop down the long list of recent school shootings. There is every reason to believe it will be second or third behind some new tragedy, just another name on a long list: Columbine, Sandy Hook, Virginia Tech and so forth. Added to these we have the rampages in Las Vegas, Orlando, and countless other places. None of this will stop unless the cult of guns is curbed. This won't be easy; the cult has a lot of money behind it. The money pours in from the "devout": small-time contributions to the NRA that amount to hundreds of millions of dollars each year. This money is used, in our skewed version of democracy, to influence politicians, who are only too happy to be bought. Our Congress is swamped with men and women, our so-called representatives, who do not represent the majority view, which is that guns must be curtailed. According to the most recent Gallup Poll, about 60% of American are either "very dissatisfied" or "somewhat dissatisfied" with our guns laws and want change. This number had fallen for a few years, it's climbing back up again. More of our neighbors and friends want nothing to do with the cult. Given this, and in the face of the horrors we see in our news feeds, why is the ability to buy and possess guns so rabidly protected by our leaders and so many of our fellow Americans? There is, of course, a false answer: We must protect the Second Amendment. Anyone who has actually read this astonishingly brief and enigmatic constitutional amendment knows what baloney will be found on that plate. Here it is; please read it. I don't care what you think about "well-regulated militias," we don't need anyone to have automatic or semiautomatic weapons in their possession, not unless they are soldiers or police officers. Rifles for hunting are one thing, handguns and repeating weapons -- such as the AR-15 used in Parkland, Sandy Hook and Las Vegas -- meant to destroy large numbers of people very quickly are another. They are weapons of mass destruction, for sale to any nut with a credit card. But statistics -- eight deadly school shootings in the first seven weeks of this year -- will not be enough to move anybody in this cult. And it's no matter that we have the perfectly good example of Australia, where for over 20 years we've watched the rapid decline in gun deaths. This is due to new, strict laws put into place after a mass shooting in Tasmania that left 35 people dead. The government bought back or confiscated over a million firearms, and there has been no mass shooting in Australia since. It works, friends. You can get rid of handguns and semiautomatic weapons, and people will stop dying on the same massive scale. It's simple math. But cults are not subject to reason. They have their fiery preachers, their arcane lore, their faith in Fox News hosts who peddle phony stories, their "churches" -- gun shows -- and deeply ingrained mythologies. These are all supported strongly by the NRA and the weapons manufacturers. Hollywood doesn't help, and never has: The American taste for violence is notorious, and we spread this ghastly predisposition around the world. Donald Trump got elected, in part, because he kowtowed to this cult of guns, pretending to be a lover of weapons, even a member, although this was a veneer. Has he uttered a single word about gun control since the shooting in Parkland? Will he? I think you know the answer, and where his bread is buttered. What would help? You. Elections. Sensible laws. But this is going to require mental and spiritual toughness, a genuine resolve to end the killing and persuade those trapped in the cult of guns that it's in everyone's best interest for them to step out of that darkness. Jay Parini, a poet and novelist, teaches at Middlebury College. His most recent book is "The Way of Jesus: Living a Spiritual and Ethical Life." The opinions expressed in this commentary are solely those of the author.